Too many paperbacks? A pile of books by your bedside that you’re never going to get to? Old college text books or books your kids have outgrown? Now’s your chance to thin out your book collection and help a great cause! The Community Service Committee will be collecting monetary donations and books to benefit Open Books at the November 22 CALL Business Meeting. Open Books welcomes any sellable book in good condition. 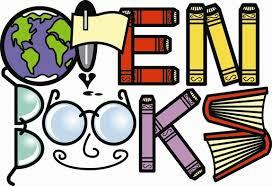 This includes fiction, nonfiction, craft books, cookbooks, children’s books, textbooks, encyclopedias, and more! They also now accept CDs and DVDs in good playable condition. They cannot accept magazines, VHS tapes, or pre-college (K-12) textbooks. Open Books is a nonprofit social venture that provides literacy experiences for tens of thousands of readers each year through inspiring programs and the creative capitalization of books. Through their Instructional Programs, they cultivate the literacy skills of thousands of children and youth each year, from those who need intervention to those who desire enrichment. Through their Book Grant Programs, they provide readers of all ages with engaging, appropriate, and high-quality books. Each week, they deliver thousands of books to schools and nonprofits across Chicagoland.